Interact Club members present at the Pinole Historical Society meeting. On Friday, February 1st, members of Pinole Valley High School’s Interact Club–Deavin Tendean, Cecilia Chak, Ralph Mauleon, Leo Chung, Angelina Vuong, Anna Chang–and Law Academy student Annett Tamayo presented to the Pinole Historical Society on their portable high school experiences. Jeff Rubin, president of the society, expressed interest in our school’s affairs and requested a group of students to share their “Spartan Story” at one of their quarter-annual meetings. 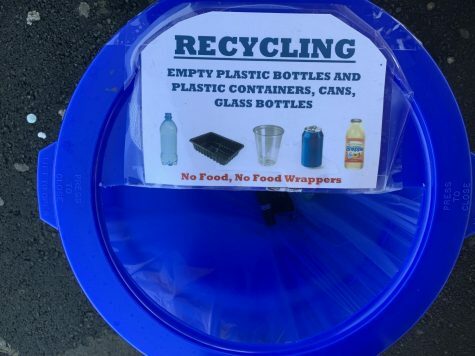 The result was an interesting exchange of ideas between Pinole Valley students from classes of the 1960s-70s (audience members) and the classes of 2019-2021. The students each presented on different aspects of their life at Pinole Valley, from rainy days to academy activities to sports. The section of the presentation that people were most impressed by was the photographs of various murals displayed on our portables. At the end of the presentation, the mic was passed around the room to answer questions from the audience, which was comprised of many PVHS graduates from decades ago. This segment of the meeting doubled the length of the presentation itself and provided insight into the community’s interest in our school and what Pinole Valley was like in its early years. Some audience members brought up heavy questions on the funding for the school and why it required reconstruction so soon, while others simply expressed their appreciation towards the presenters for coming to share their story, something that many have been curious about over the years. Through this discussion, we learned about Pinole Valley High School’s past struggles with racial integration, the falsity of the presumed idea that buildings should last longer than people, and the fact that our current portable campus is simply a replay of what happened to other schools in the area years ago. What the audience expressed the most interest in was our learning opportunities beyond the classroom, such as academy internships and field trips. 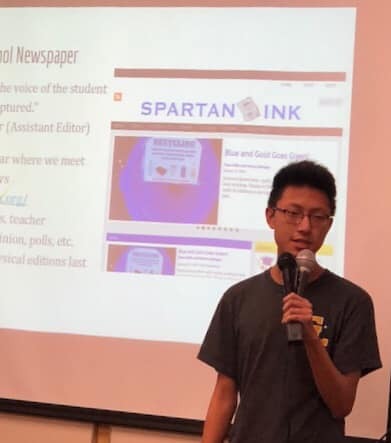 Senior Leo Chung discusses Spartan Ink, the school newspaper, at the Pinole Historical Society presentation. The next Monday, February 4th, Pinole Historical Society president Jeff Rubin visited our school to give a presentation on Pinole’s history, beginning with its Native American settlement. The name “Pinole” originates from “pinolli,” a form of ground maize (cornmeal) that was a staple food for settlers in the area. With western expansion, Pinole became a vast area of farmland and gradually developed with roads into the small city that it is now. Jeff’s presentation was full of old photographs of Pinole, especially from downtown. Students in the audience enjoyed guessing what is located at those areas currently and reflecting on how much Pinole has developed over the years. Many streets are named after important historical figures, like the Faria and Tennent families. Jeff also elaborated on the West Contra Costa Unified School District’s controversial formation and the origins of the “Flag Hill” located across the freeway. The Pinole Historical Society’s next meeting (Feb. 15, 6:30 to 8 PM in conference rooms 2A and 2B of the Kaiser Permanente Medical Office Building, 1301 Pinole Valley Road) will feature an update on the new Pinole Valley High School from Lathrop Construction and WLC Architects. All are welcome and refreshments will be served. Students who are curious about our new school’s progress are encouraged to attend.